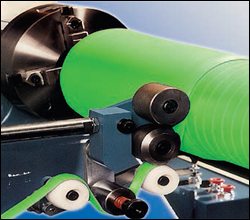 ZENITH strip builder offers synchronized consistent rubber application for large or small rollers. Machines are designed for efficient performance. Designed with provision of cold feed and hot feed extruders with built-in electrical,pneumatic controls and other application equipments. Roller covering extruder plant complete with movable carriage holding the cylinder to be covered. Maximum Power Consumption 26 H.P. Maximum Power Consumption 28 H.P. NOTE: Zenith also make above Strip Builder Machine in 5000mm length on Customers requirement. Maximum Power Consumption 33 H.P. NOTE: Zenith also make above Strip Builder Machine in 7000mm length on Customers requirement. Maximum Power Consumption 45 H.P. NOTE: Zenith also make above Strip Builder Machine upto 10000 mm lenght on Customers demand.